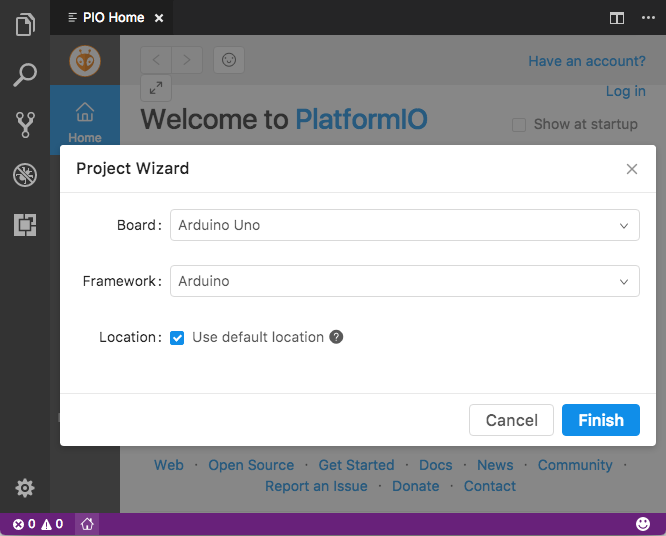 PlatformIO IDE is the next-generation integrated development environment for IoT. Please note that you do not need to install PlatformIO Core (CLI) separately if you are going to use PlatformIO IDE for VSCode. PlatformIO Core (CLI) is built into PlatformIO IDE and you will be able to use it within PlatformIO IDE Terminal. This tutorial introduces you to the basics of PlatformIO IDE workflow and shows you a creation process of a simple “Blink” example. After finishing you will have a general understanding of how to work with projects in the IDE. The code below works only in pair with Arduino-based boards. Please follow to PlatformIO Project Examples repository for other pre-configured projects. * then off for one second, repeatedly. 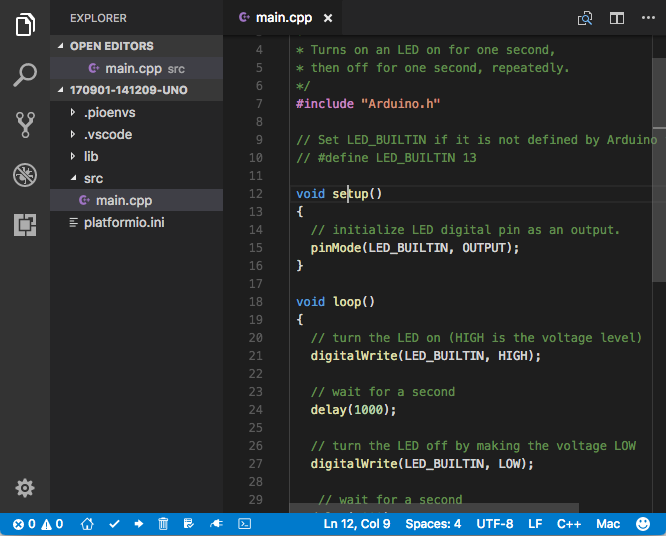 // initialize LED digital pin as an output. Learn more about PlatformIO Toolbar and other commands (Upload, Clean, Serial Monitor) below. 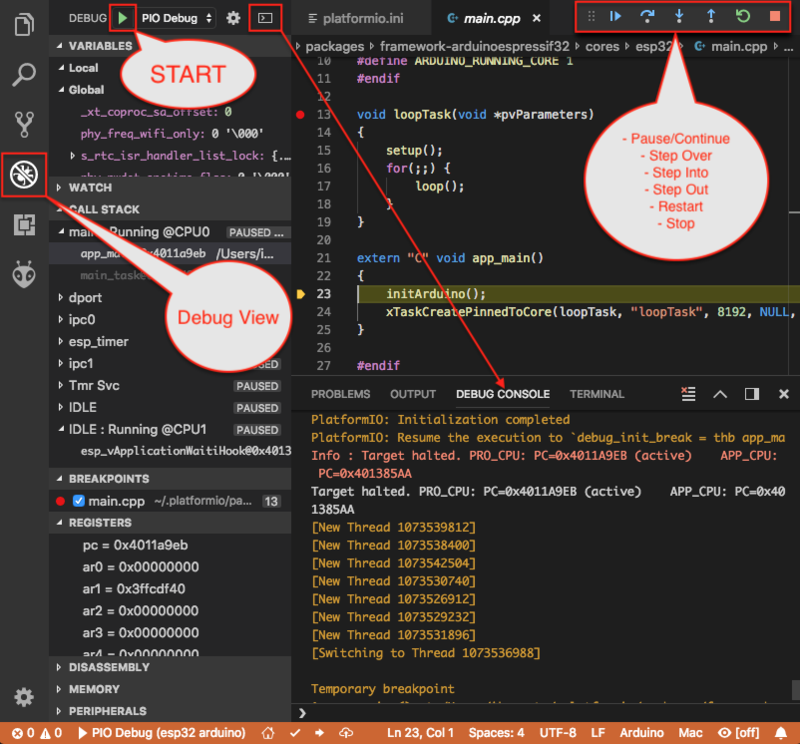 PlatformIO IDE Toolbar is located in VSCode Status Bar (left corner) and contains quick access buttons for the popular commands. Each button contains hint (delay mouse on it). You can override default “PlatformIO: Build” task for “Build” command which is used by “Build” button in PlatformIO Toolbar and Key Bindings. See platformio-ide.buildTask setting in Settings for more details. Built-in PlatformIO tasks are available in “Menu > Terminal > Run Task…” list. You can override existing key bindings or add a new in VSCode. See official documentation Key Bindings for Visual Studio Code. PlatformIO provides access to “Project Task Explorer” where you can control build process of declared environments in “platformio.ini” (Project Configuration File). Project Task Explorer is located in VSCode Activity Bar under branded PlatformIO icon. 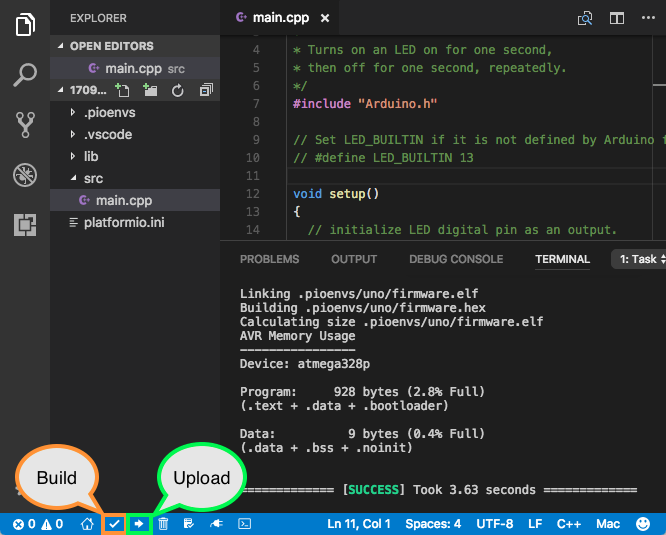 You can also access it via “VSCode Menu > Open View… > PlatformIO”. 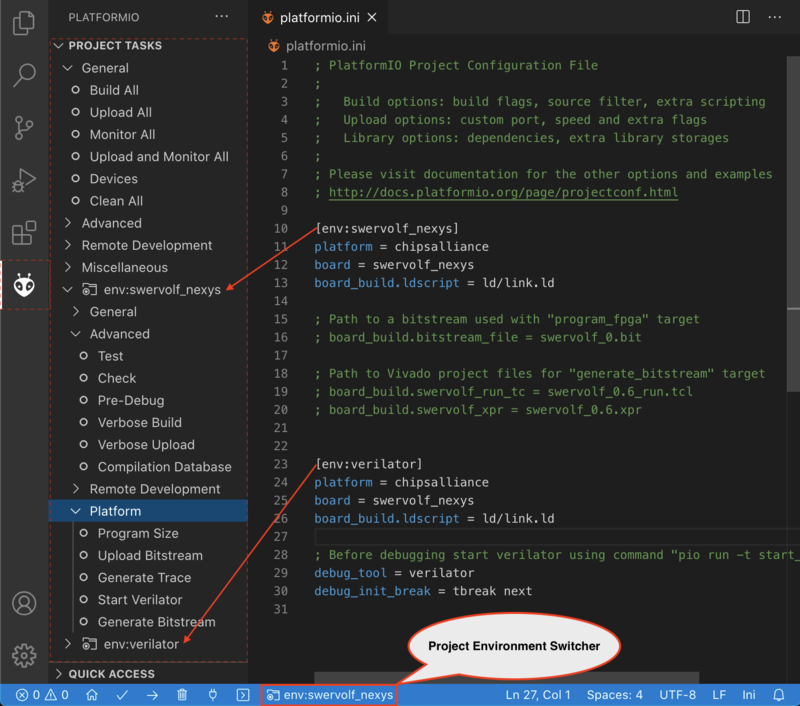 PlatformIO IDE provides base tasks Menu > Termina > Run Task... (Build, Upload, Clean, Monitor, etc) and custom tasks per “platformio.ini” (Project Configuration File) environment ([env:***]). A default behavior is to use Terminal Panel for presentation. Also, we use dedicated panel per unique task. 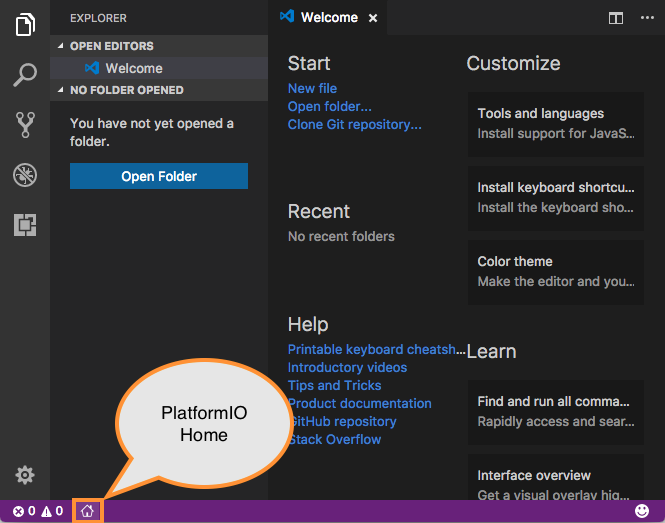 PlatformIO IDE provides own Problems Matcher named $platformio. You can use it later if decide to change base task settings. See more options in official VSCode documentation. Custom tasks can be added to tasks.json file located in .vscode folder in the root of project. Please read official documentation Tasks in VSCode. This simple example demonstrates a custom build process in verbose mode. There are a lot of other commands, please read more about PlatformIO Core (CLI) and its commands (CLI Guide). "label": "PlatformIO: Monitor (local echo)"
You can work with multiple project folders in Visual Studio Code with multi-root workspaces. This can be very helpful when you are working on several related projects at one time. Read more in documentation Multi-root Workspaces. 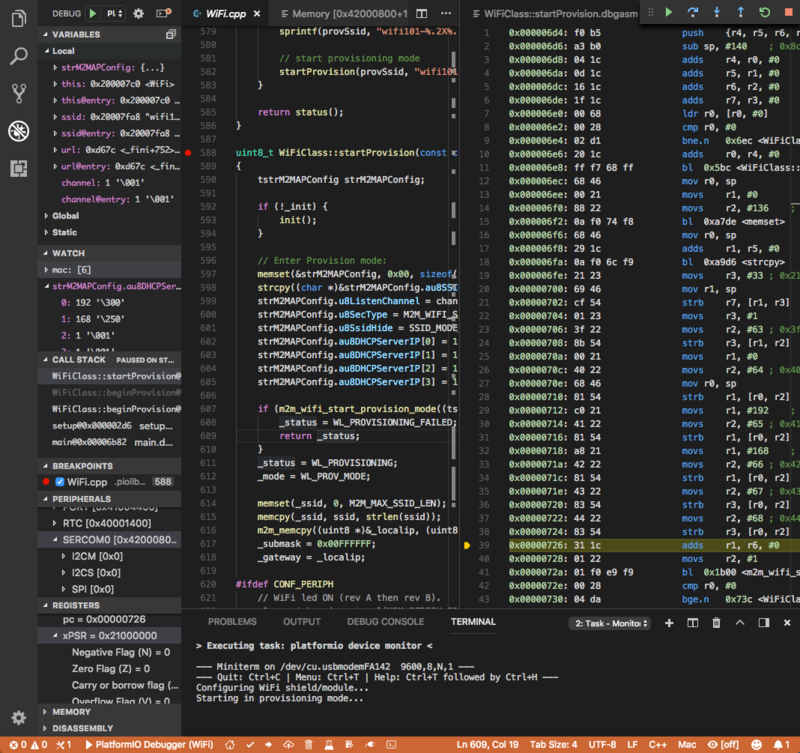 Debugging in VSCode works in combination with PIO Unified Debugger. You should have PIO Account to work with it. A hot restart of an active debugging session. Default configuration. PlatformIO runs Pre-Debug task and builds project using Debug Configuration. Also, it checks for project changes. PlatformIO skips Pre-Debug stage and DOES NOT build or check project changes. If you do changes in project source files, they will not be reflected in a debug session until you switch back to “PIO Debug” configuration or manually run “Pre-Debug” task. This configuration is very useful for quick debug session. It is super fast and skips different checks. You manually control project changes. Please note that PIO Unified Debugger will use the first declared build environment in “platformio.ini” (Project Configuration File) if env_default option is not specified. Currently, VSCode does not provide UI/API to change variable format. See related VSCode Issue #28025. Possible values, listed in decimal base, are: 8, 10, 16. Please read GDB: Setting Watchpoints before. Please navigate to PIO Core Install Shell Commands. How to configure VSCode settings? Activate extension only when PlatformIO-based project (with “platformio.ini” (Project Configuration File)) is opened in workspace, default value is false. Automatically close platformio device monitor before uploading/testing, default value is true. Automatically rebuild C/C++ Project Index when “platformio.ini” (Project Configuration File) is changed or when new libraries are installed, default value is true. A build task (label) which is used by “Build” button in the PlatformIO Toolbar and Key Bindings. Default is set to PlatformIO: Build. You can create custom Custom Tasks and assign to platformio-ide.buildTask. Custom PATH for platformio command. Paste here the result of echo $PATH (Unix) / echo %PATH% (Windows) command by typing into your system terminal if you prefer to use custom version of PlatformIO Core (CLI), default value is null. Force “Upload and Monitor” task for Upload (platformio-ide.upload) command, default value is false. Configure time in milliseconds after which reopen Serial Port Monitor, default value is 0, which means reopen instantly. Update Terminal configuration with patched PATH environment, default value is true. Use built-in PlatformIO Core (CLI), default value is true. Use development version of PlatformIO Core (CLI), default value is false. This is a known bug in VSCode Terminal issue #61. A temporary solution is to install packages using a system terminal (not VSCode Terminal). Please use “Solution 3: Run from Terminal” in FAQ > Package Manager > [Error 5] Access is denied.